If you don’t want to rattle and bumping along the roads or railroads of Myanmar, despite it rather low fare charge, you can choose between a number of airlines with domestic operation. The routes covers all of the country from Kaw Thaung in south to Puta O in north. Most domestic routes are operated with turbo-prop planes – the French-Italian ATR planes seems to be popular. 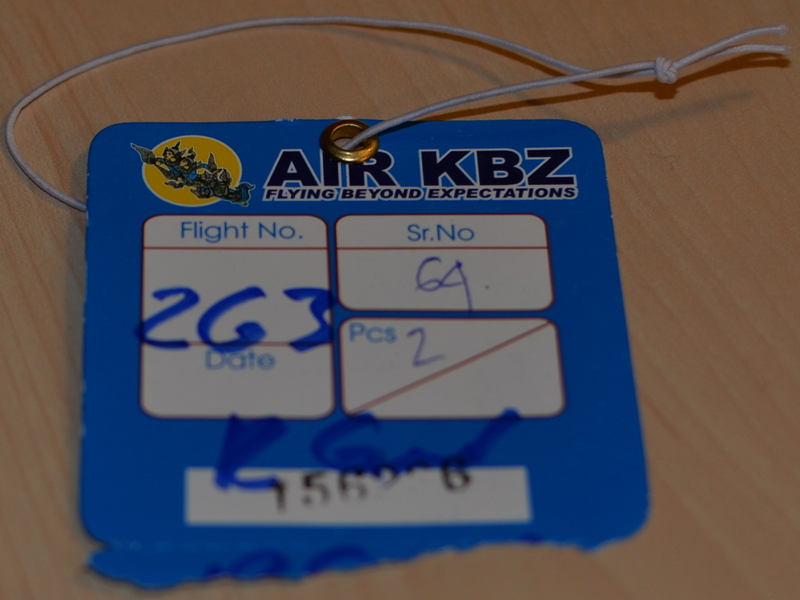 This means a lower speed than if they used jets, so a trip from Yangon to Kaw Thaung will take around 3 hours. To secure a better utilisation of the seats most routes are not direct but includes one or more stops to allow some of the passengers to get off and new to get on. Quite practical but when you are going from Heho to Yangon and must take a trip around Bagan (half an hour in the wrong direction) it don’t seem that practical. But when you compare the opportunity to run the night bus for 12 hours with a 2 hour flight it seems ok. Even though the flight costs almost 10 times the bus. From my experience the planes are not delivered directly from ATR to the companies in Myanmar, but have served time at a first hand owner. As the ATR turbo-prop models where introduced in 1989 they can be as old as 26 years, not that european air-lines don’t operate that old planes for special purposes, but the planes seems old fashioned. The airports are not exactly like European airports. The check-in counter is not equipped with a computer, the staff has a paper list with passengers and checks passports against the list. When your luggage is equipped with id it will not the known self adhesive type but a business card sized piece of cardboard where flight number and passenger id is hand written with a permanent marker. Then you get a small sticker to put on your shirt, the sticker identifies the airline and the flight you are going with. When you reach the security check you don’t have to take of shoes, belt, jacket or remove computers from the bag. Just send the bag through the ancient x-ray scanner. The departure waiting area can by first glance look a bit like a European airport waiting area, but when you look closer you will se that there is not monitors with traffic information. 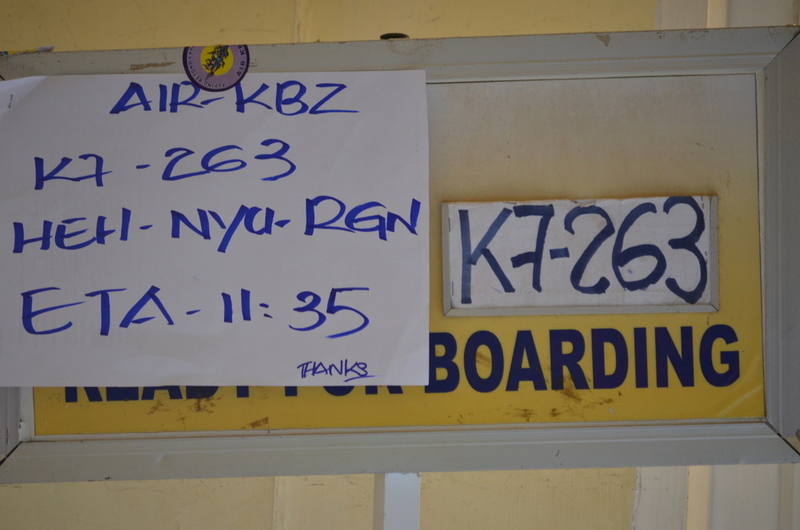 You might find a piece of cardboard at the gate where information of the next flight is shown. When your flight is finally due, go to the gate and if your sticker matches the flight in question, you’ll be sent through the door that leads directly out to the apron, just walk across the tarmac and climb up the latter to the plane. There will be free seating, so you’ll not need information the seating information from your boarding card and you don’t have one. 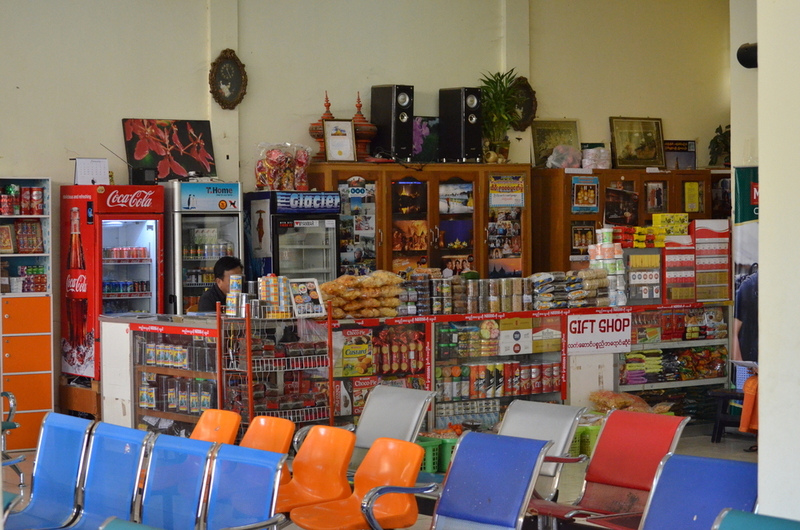 On the trips I’ve flown in Myanmar there have been a least one serving of soft-drink and either a snack or a sandwich package. Just before landing the stewardesses went around with a tray with hard candies. Rumours says that some of the Myanmar Airlines do not live up to the standards of plane maintenance of the West and some are not allowed to fly in the EU, but as not that many of the airlines fly to EU it might not be the best measurement.